The theme of this year forum is "Transportation Infrastructure Durability and Sustainable System for Eternal Peace and Prosperity." A wide variety of participants, from construction industries, consulting firms, federal, state and municipal agencies, and academia, are expected to attend. The brochure, which includes a detailed agenda, can be viewed here. Keynote speakers will include Prof. William G. Buttlar of University of Missouri, who is serving as Glen Barton Chair; Peter Alviti Jr., P.E., Director of RI Department of Transportation; and Consul General Yonghyun Kim of the Republic of Korea. Presentations will be made by New England faculty and researchers, as well as poster presentations by URI researchers and students. 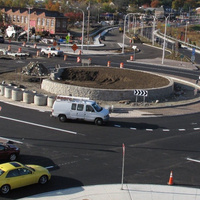 Some of the topics will include sustainable pavement design, reclaimed asphalt pavement, full depth reclamation, cold central plant recycling, cold in-place recycling, resilient infrastructure, green technology, disaster prevention and evacuation, traffic congestion, solar energy harvesting, and much more.